See yourself dancing across those gleaming floors. At Beyond Carpet Cleaning, we know you’ll not only get the best quality floor cleaning service, but the best customer service as well. We make it our business to go beyond the second mile in providing not only information but also solutions to your floor cleaning needs. 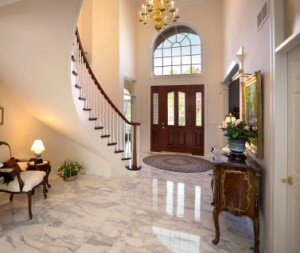 We also know that a satisfied customer is one that will be returning to us for our professional Marble and Terrazzo Floor Polishing service, as well as all your other floor cleaning and restoration needs. Whether it’s carpet cleaning/repair, detailed tile and grout work or cleaning of fine furniture, we will treat you with honesty and integrity and fairness. If something isn’t right we’ll make it right! Pronto Tonto. We do what we say we will do. As rare as that is we actually do what we promised. Specially trained and experts in their field, our technicians are up-to-date with the latest in cleaning techniques and processes because they are professionals in every sense. Being natural and porous stones, marble, and terrazzo floors need special attention to the cleaning and polishing process. This is our forte! Both stones have unique qualities that won’t settle for anything less than expert and skilled workmanship. That’s why our Marble & Terrazzo Floor Polishing Services have earned the industry’s recognition and speak for themselves. Being a family owned business, we at Beyond Carpet Cleaning have our own values. One of them is that we insist on using only the most rugged, top-of-the-line equipment, tools and environmentally safe cleaning supplies in the business. Call today and be sure to speak to Jimmy the owner or any one else part of the Beyond Carpet cleaning family. Serving Hinsdale and DuPage county.